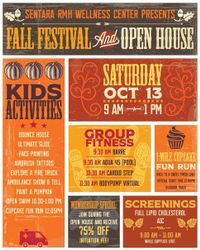 The Sentara RMH Wellness Center will be open to the community for a morning full of fun for the entire family! Kids will enjoy face painting, jumping in the bounce house, sliding down the ultimate bounce slide, exploring a fire truck and patrol car, and so much more! Bring your friends and neighbors to try group fitness classes, explore the fitness floor, get a free cholesterol screening, and take a guided tour! Door prizes and special discounts all morning long!